We have available a lovely fully self-contained Studio which is located in the heart of Mairangi Bay. •	Our studio has its own private entrance and is well positioned North facing (this is perfect in the Southern Hemisphere) with great indoor/outdoor flow to a lovely large sub-tropical garden and deck. •	Studio facilities include all the usual home appliances, Queen size bed, Double sofa bed, portacot. FREE Wifi high-speed Broadband connection, Digital Sky TV. •	All good quality linen provided – even beach towels if you need them. •	Only 10 minutes drive to North Harbour Stadium and approx. 20 minutes drive to Eden Park. 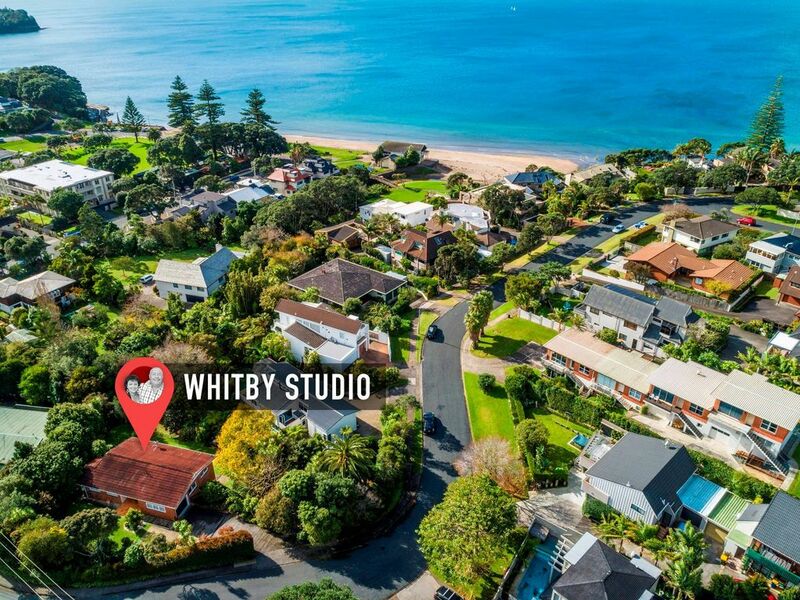 •	Less than 200 metres walk to beautiful Mairangi Bay Beach (via a walkway through Whitby Crescent or Sidmouth Street – just around the corner. •	Murrays Bay (Yacht Club) and Campbells Bay only a 5-10 minute easy stroll around the coastal walkway or just walk over the hill. •	Albany Mega Centre, the new Westfield Shopping Mall and AUT Massey University are a 10 minute drive. •	Millennium Institute of Sports Centre only 3km away. •	On main bus route, Takapuna (10 mins), Auckland City (20 mins off peak). •	Shuttle service from Auckland Airport approx. $100.00 one way. Check in no earlier than 1.00 p.m. - or earlier by request and availability. Check out no later than 10.00 a.m. - or later subject to availability. Would prefer a minimum of a 3 night stay. We are a couple in our fifties who really enjoy meeting people from all over the world as we have both extensively travelled and know what it is like trying to find accommodation which suits, and not having to pay the earth for it. We have had our studio accommodation available now for 12 years and enjoy meeting people and sharing experiences. We pride ourselves on the fact that we make sure that our guests have total privacy but we are here if they need us for advice. We love living in Mairangi Bay because it has a lovely village atmosphere and is surrounded by beautiful beaches and coastal walks. It is a special place in the 'City of Sails' which we like our guests to enjoy. Good shops and restaurants only a couple of doors away. Beautiful beach and coastal walks only 9 doors away. On main bus route to other parts of the North Shore and Auckland City. Bathroom with shower, toilet and basin with separate cupboard for storage. We live right in Mairangi Bay Village where the shops, restaurants are only a couple of doors away and the beach is only 100 metres away up our street down a walkway right onto the beach. As room was not available for a dryer to be installed in our studio, we do offer our guests the use of our dryer - especially during the winter months. Please just ask us and we can organise this. Parking is available for our guests on our property. Please just park in front of our garage door as the garage is used only for storage so we do not need access to it. We both park on the left side. This is not available to our guests as it is used only for our storage. High-speed Fibre Optic - unlimited data. As our studio is one room only, you will be living, eating and sleeping in the same room. Our studio is 37 square metres so a good size and especially comfortable for two guests. Coffee, Tea, Sugar, Salt, Pepper and a few other bits and pieces available. Glassware, Crockery, cutlery, cooking utensils, pots and pans all available in your kitchenette. Fully self-contained kitchenette with most equipment that you will need for a short or even a long stay. Fold down table with 4 chairs. Childs highchair available on request. Wonderful studio with everything one would need. Kathy and Hec have thought of everything. Great location within walking of restaurants and grocer. Quick walk to beach and Cliff Walk. Short drive into Devonport and Auckland. Thanks Linda and John, we are very happy that you did enjoy your stay here in Mairangi Bay. As we are seasoned travellers ourselves we try to think of things to place in the studio to make life easier and we hope this helps our guests to have a stress free and enjoyable stay. Thanks again for your comments and we wish you a great time here in our country. Comfortable, great value, clean and tidy. Worked well for our purposes. Friendly hosts. We stayed here while involved in a tournament at North Harbour Hockey. Worked really well as a base, nice and close. Hosts easy to communicate with and very welcoming. Very handy location with everything we needed. Very handy location with everything we needed. Would definitely stay again. Delightful studio - very spacious with quality linen, fittings & kitchenware. Whitby Studio represents great value. Whitby Studio represents great value. ; It is in a fantastic location with local shops for everything you need and the beach at the end of the road. The accommodation is very clean and has everything you need, in a peaceful garden setting.